Paul Moorhouse was an apprentice engineer working for Rolls Royce. 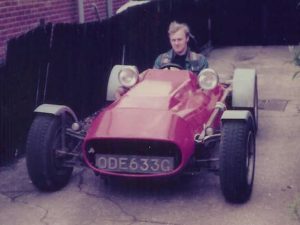 Over time as College and hobby projects he built several different cars including two Jaguar based specials and a single seater (picture below) which was based on Triumph Vitesse components. 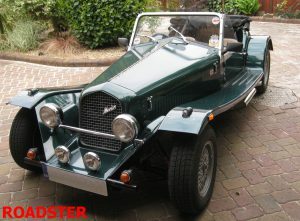 He also built two similar looking traditionally styled open two-seaters whose shape was inspired by pre WW2 Alfa Romeos. He was encouraged by friends to put the idea into production, and thus “Marlin” was born. When he first went public with the Marlin in 1979, one of these two prototypes (536 URR) had already served 5 years as Paul’s daily regular transport. It was used in the original photo shoot (see picture below) and adverts, but has not been seen for a while and it’s whereabouts are not known. The second prototype car, (JRR 929D) is alive and well, and currently (Summer 2015) has had a total rebuild by the Club Chairman Derek Jones. 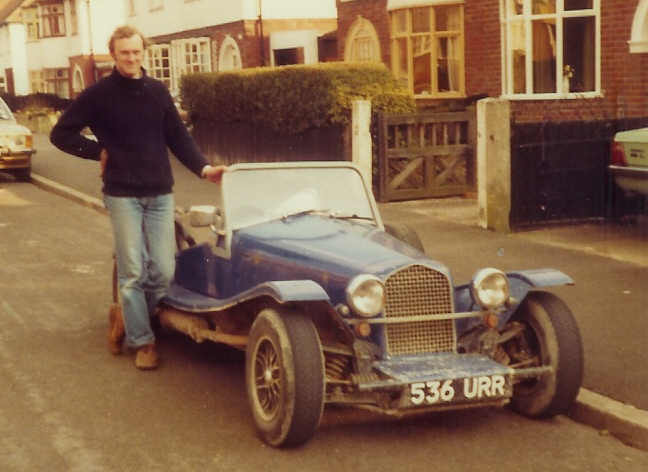 The first production Marlin Roadster chassis was was laid down on 1st July 1979 and the first kit was sold to a Simon Lister for the princely sum of £655 inc VAT. 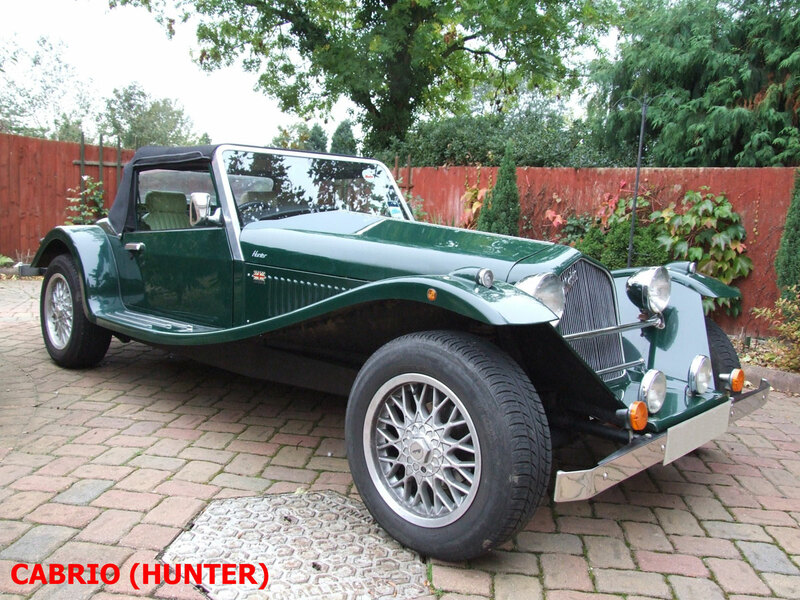 Unlike many other kit cars of the 1970s and 1980s, which used the (usually rusting) chassis or floor pan of the donor vehicle, the light and nimble Marlin is built around an extremely sturdy box section chassis with an innovative roll-over bar integrated in the windscreen frame. 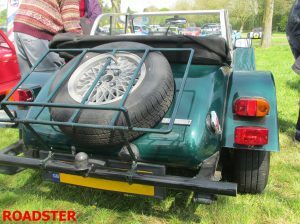 This chassis was cleverly designed to maximise the use of running gear from any Herald, Vitesse, Spitfire, GT6 or even Bond Equipe – and also catered for the Rotoflex rear suspension from later models of Vitesse and GT6 by virtue of additional drillings in the chassis box sections. 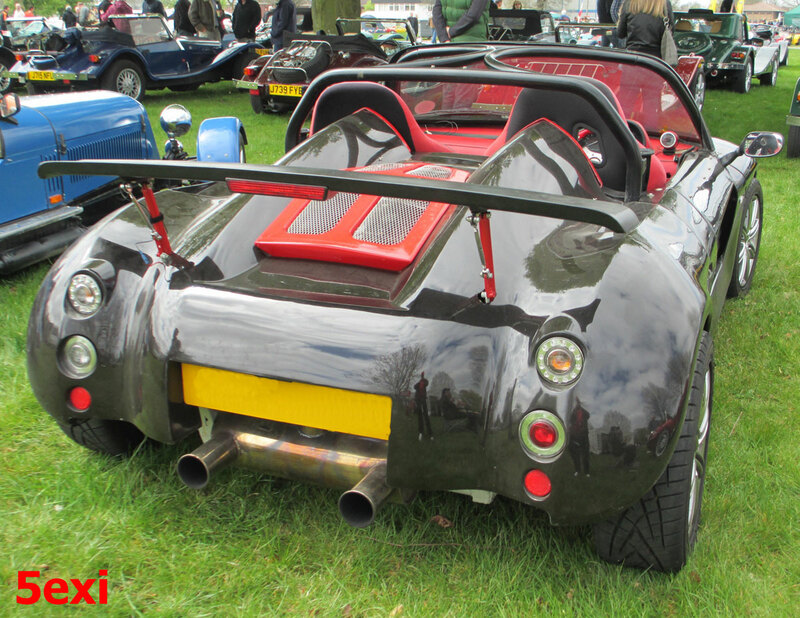 The bodywork is a combination of aluminium for the flat panels, and fibreglass for the moulded sections, including the distinctive radiator cowl, the outer wings, and the rear bodywork. The early Roadsters used Triumph mechanical components from the Herald, Vitesse, and Spitfire ranges, and are generically known as Mark 1’s. 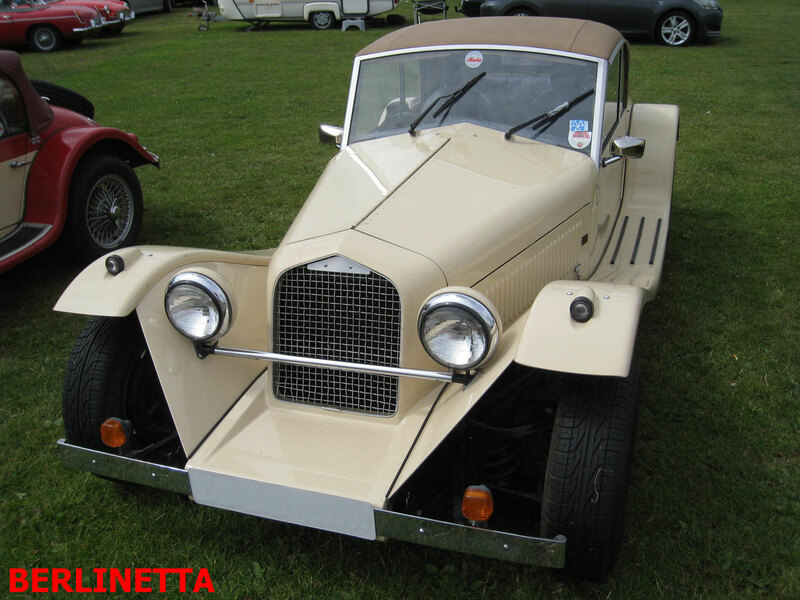 The all Triumph based cars had subtle changes in body and chassis design from the prototypes, and evolved gradually during the production run. Doors were an option on all cars from quite early on and they don’t give an indication of age, as some later cars had none! 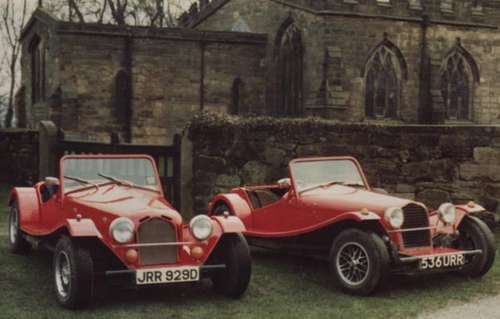 The last Triumph based kit was produced in June 1983, and of the 236 all Triumph kits produced approximately 160 are known to have been put on the road. 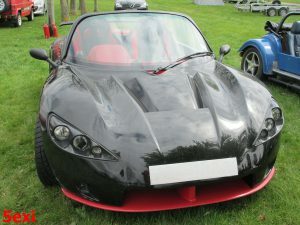 The Roadster was developed into a Marina/Ital based kit, which looked very similar to the earlier cars but used the Morris Marina/Ital as the donor vehicle, and the majority were built from a single donor car using all Marina mechanicals, the engines including the 1275cc A-Series, 1700cc O Type, and 1800cc TC (twin carb) B-Series. However, the Triumph front suspension was always well regarded by engineers (more than could be said for the rear !) so Marlin also built kits using Triumph front suspension and Marina rear axle and suspension, these are known as “Hybrids”. 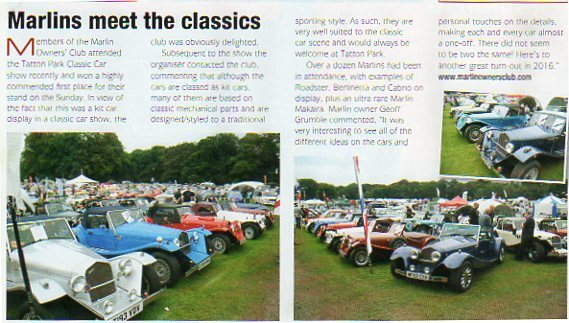 Over the years, various engines have been used from the original Triumph 4 and 6 cylinder engines, Ford Kent and Pinto and Zetec engines, various Italian twin cams and even the Rover V8.This all made for varied and exciting motoring and Marlins are a particular favourite with the trials brigade. The cars weight distribution and short wheelbase allow it to travel over muddy lanes and rocky tracks better than less advanced designs. The pictures below are of an Ital based Roadster. Of those who had bought Roadsters originally, some now wanted more room for offspring and partners who also wanted to enjoy the fun of the Marlin. In 1984 the Ford Cortina (and later, Sierra) based Berlinetta was launched. The car’s curved windscreen top is a positive identification. 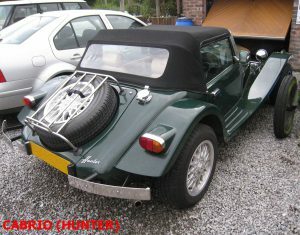 This came complete with previously unheard of luxuries such as wind-up windows, a lockable boot and a hardtop option. As with the Roadster, the Berlinetta could be made to accept an almost unlimited number of different engines. 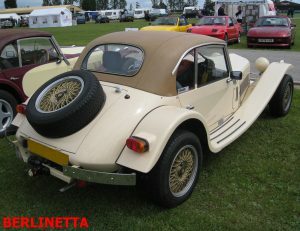 A touring car rather than a sports car, sales of Berlinettas were fewer than the Roadster, mainly due to the more limited market for such a car. In 1993 the rights and production of the Roadster and Berlinetta models were sold to YKC Engineering in Yorkshire. Over time, as well as updating the Roadster and Berlinetta using Sierra suspension, YKC added the Romero, Raider, Mille Miglia, Julietta and Immola body variants to their line-up. 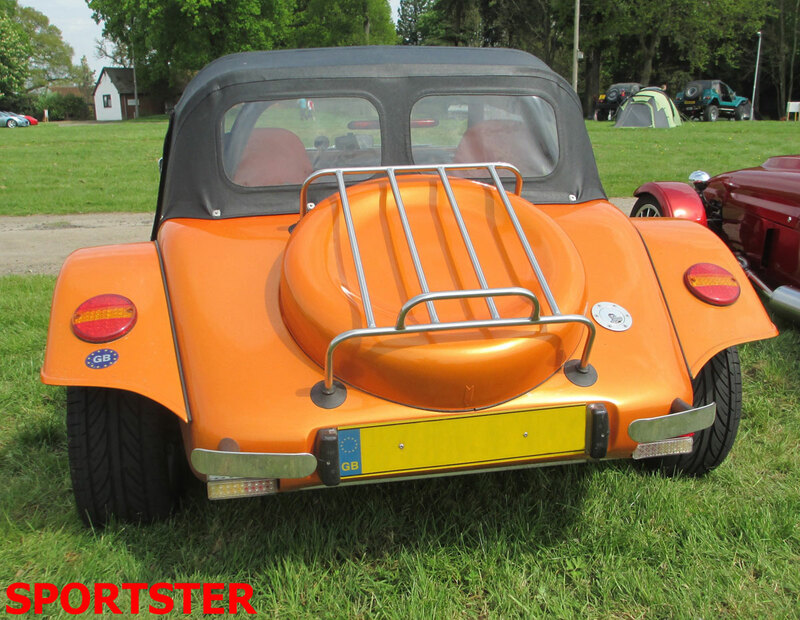 These latter cars, although mechanically up to date and SVA compliant, retained many styling features familiar to Roadster owners. Don Burt, who owned YKC cars, retired in 2006 and the business was acquired by Milan Mladenovic and re-badged as Aquila Sports Cars, who launched their Julietta S at Stoneleigh in 2006, however the business did not prosper. Returning to the Marlin story, in October 1997 the company was bought by Terry and Mark Matthews and they, as the new owners of the remaining Marlin marque, introduced the turnkey Hunter. 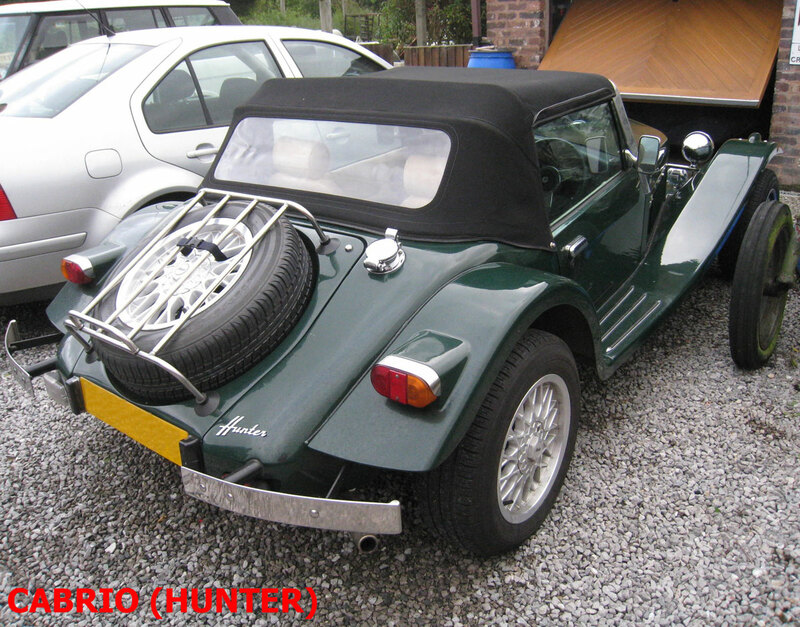 Using the Cabrio as its base, the Hunter was a factory built car featuring a high quality of assembly but allowed customers to request features to make their chosen car unique. 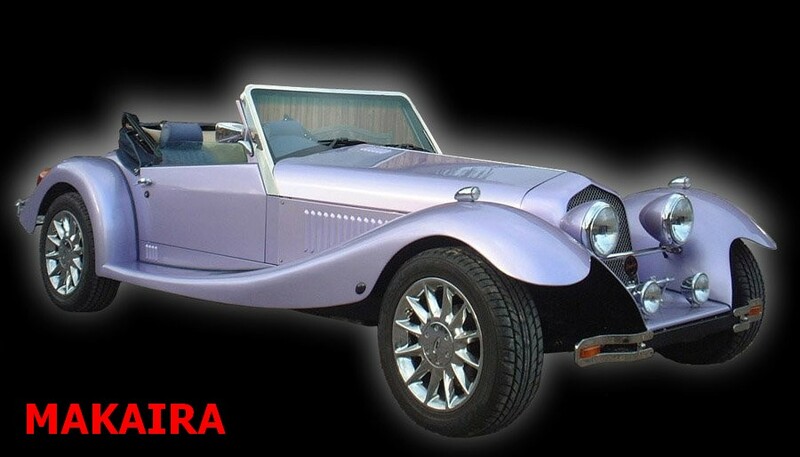 Also in 1997, in response to a demand for the Lotus 7 type of car, Marlin added the Sportster model to their range. With more room inside, good weather equipment, doors and boot space, the Sportster was welcomed. 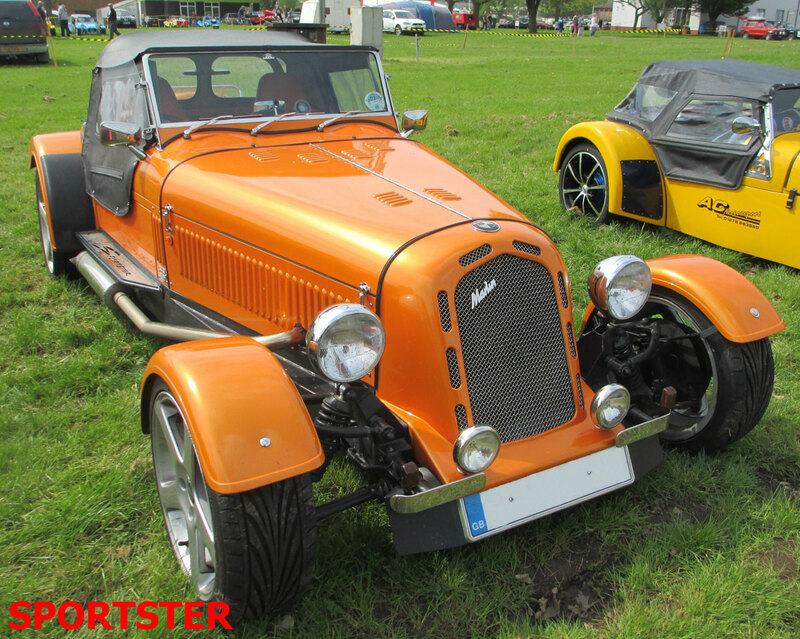 In 2002 the Sportster was re-launched with a brand new suspension and engine package, the older Ford components being replaced by sourced from BMW’s 3-series. With this upmarket, yet affordable new donor came the promise of more exciting engine options (over 320bhp with the M3 Evo unit) and more refined and capable suspension and braking components. Once again the new BMW package allowed the builder to assemble a Sportster using just one donor. In 2002, and to celebrate twenty years of the Marlin name, the factory embarked on its most audacious project yet The V8 powered Makaira was a benchmark car for Marlin, embodying everything the company had learnt in developing the turnkey Hunter, in order to produce a highly exclusive, all aluminium bodied traditional roadster. 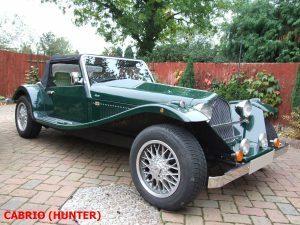 With a price tag of over £40,000, this beautiful car took Marlin into yet more unchartered waters and continued the company’s heritage of pushing the boundaries – unfortunately, only one was ever built. 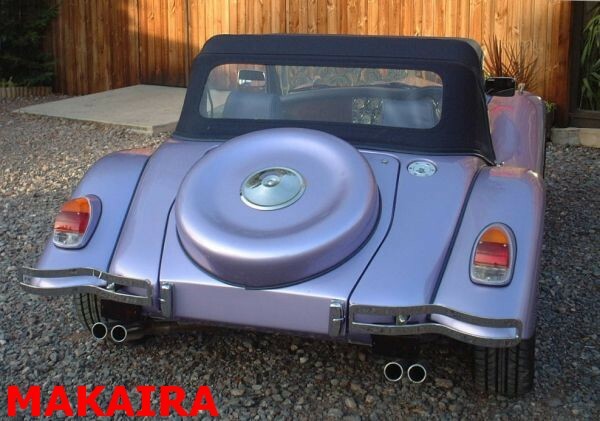 The original launch of the Sportster had seen Marlin coming into more regular contact with a younger customer, and the Kool Kars 5exi was launched in 2003. Designed around the Rover K-Series engine/gearbox unit, this car offers a low-cost, easy-build with contemporary styling, and despite the move to a mid-engined layout the 5exi maintains many of the traditions of Marlin engineering, once again using an unusually large number of components from the one source. 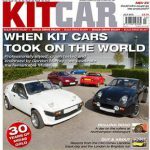 Most recently, the car has been changed with the addition of full height doors and the option of using Honda’s Type R VTEC engine, and a Racing Club has been formed for owners. 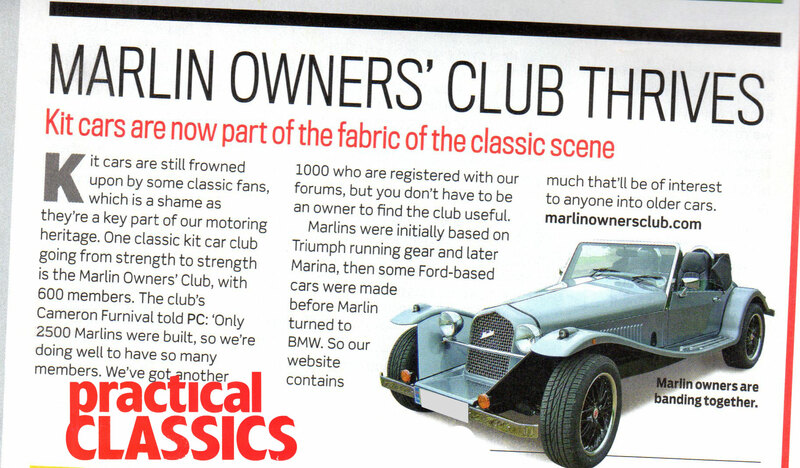 In 2006, Marlin cars sold the rights for the Cabrio to Javelin Cars, who had worked with Marlin to develop the Mk 3 Cabrio that would use the BMW 3-series E30 model as the donor car. 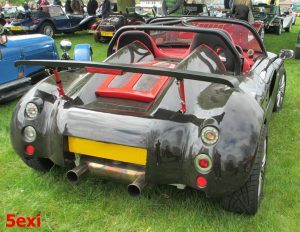 Unfortunately due to a down turn in the economic market the only Javelin car produced was the demonstrator.